The manufacture of decorative boards and cladding panels became a booming industry after WWII. 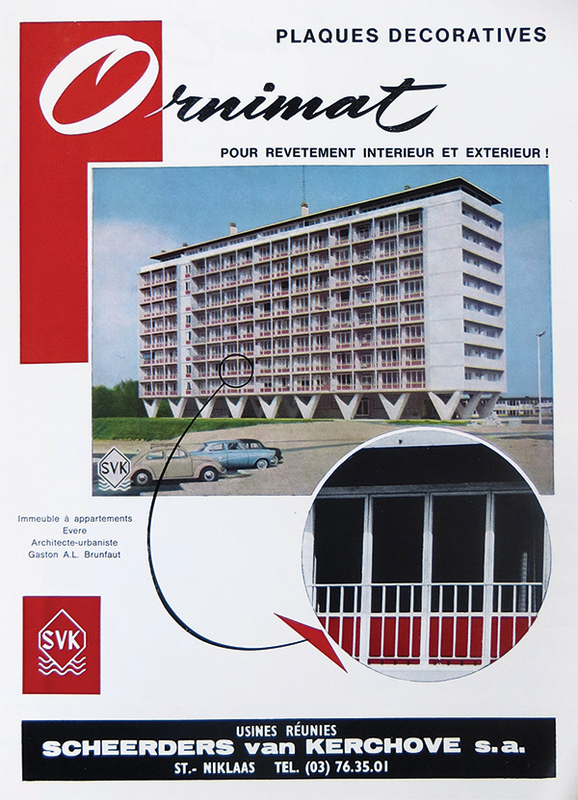 Eternit started with the production of Ardex corrugated panels in asbestos cement. The multilayered panel with wood fibres Novopan, available in Switzerland since 1947, was produced in 13 countries. Eternit founded the subsidiary company Gyproc-Benelux and became the first manufacturer of plasterboards in the Benelux. 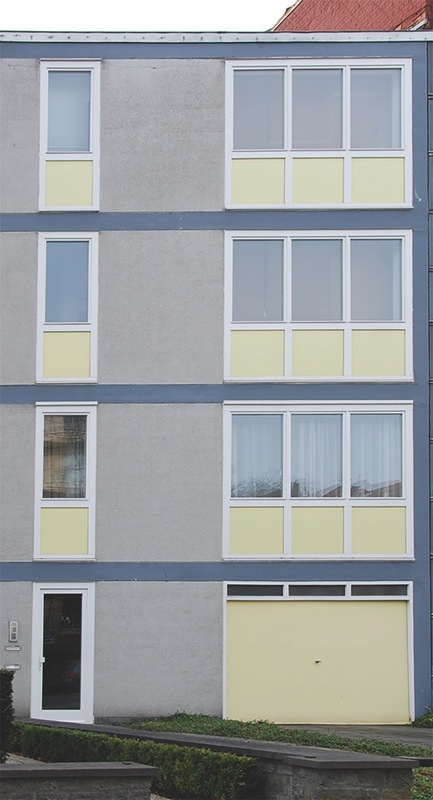 Articles on new houses in Brussels show that the use of cladding and sandwich panels increased between 1958 and 1966. Manufacturers responded to various architectural trends and functional demands by offering a broad range of products. 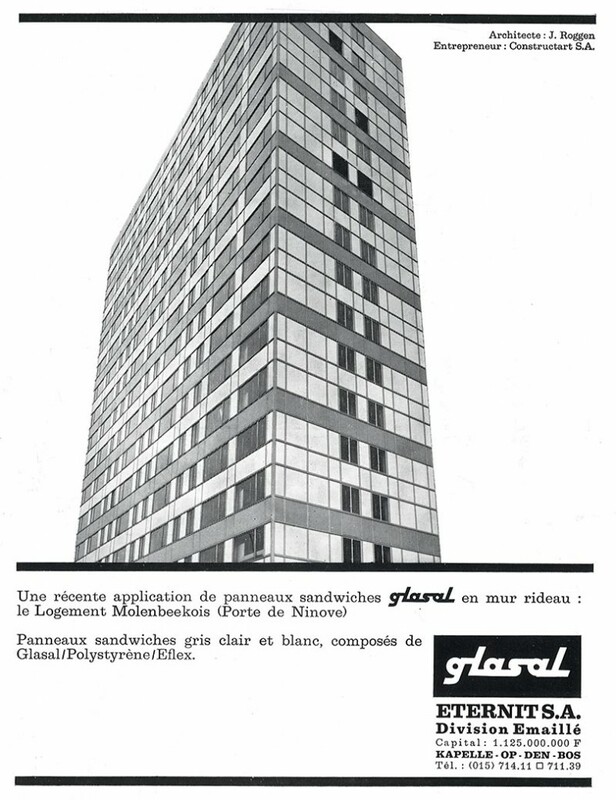 Gyproc-Benelux started with the production of the Metal-Stud frame in the late 1960s. Glasal panels were being exported to 50 countries in the late 1960s. The BBRI published two articles in which concerns were raised about the proper installation and durability of plastics. A Belgian branch of The Formica Company was set up. Formica panels were available in 150 designs and three different finishes. The continuous increase in the use of asbestos cement stopped. Although decorative boards and cladding panels were already used before the Second World War, it was not until after 1945 that their manufacture became a booming industry. This evolution was stimulated by progress in production techniques (e.g. wood processing and improvements in synthetic glues), as well as new trends in architectural design. New building typologies and elements such as curtain walls and partition walls incorporated sandwich panels and boards. The bright, colourful panels and boards used on the façades and interior surfaces of post-war buildings gave them a distinctive appearance that defined architectural modernism. Throughout the post-war period, and especially during the 1960s, manufacturers responded to various architectural trends and functional demands by offering a broad range of products. Panels were made of many kinds of raw materials, including wood (waste), asbestos cement, gypsum, flax, hard plastics, and laminates (concrete panels are discussed in the next chapter). They were usually produced with synthetic resins, cement, or other binding agents, and possibly coated with enamel, melamine, veneer, cellulose, or paint. In many cases, several layers of the same or different materials were combined, to enhance specific performance characteristics. The functions these single or multilayered panels and boards were designed to fulfil were numerous: in addition to their decorative aspects, they could offer good thermal and acoustical insulation, and be lightweight, quick to install, cheap, impermeable, easy to maintain, form-retaining, colourfast, and durable. Cladding and sandwich panels seem to have become a panacea in post-war architecture in Belgium. Wood, and in particular wood fibres and wood waste, was intensively used in the manufacture of decorative boards and sandwich panels, as it was readily available in large quantities. At the beginning of the 20th century, up to 70% of the lumber used in the wood processing industry became waste. The wood fibre panel industry (which took off in the U.S.A. in the 1920s, with for instance the Masonite panel invented by Henry Mason) turned this wood waste into a resource for making other building products. In only three decades, the industry came into full bloom, not only in America but also in Europe. The history of the wood fibre panel industry can be seen as a search to overcome the disadvantages of wood as a natural material, such as its sensitivity to moisture and microorganisms. The development of the chemical industry, and new synthetic products, helped to solve such problems. An important advantage of wood fibre panels is that they could be processed, attached, and finished using traditional woodworkers’ tools and methods (sawing, nailing, screwing, painting, varnishing, etc.). In the post-war period, the most common way to classify the different types of panels was by their density and hardness; this resulted in the categories of porous, half-hard, hard, and extra-hard panels. The first steps in the production process were similar for all of these types of panels. Firstly, the wood fibres were mixed with a binding agent (mostly synthetic or natural resins), water, and sometimes hardeners into a paste that was spread out onto large tables. Next, pressure was exerted to create flat panels and remove excess water. The panels could be dried without additional pressure or heat, creating porous panels. Another option was to dry them by applying heat and pressure with a hydraulic press, causing the resins to polymerize and giving the panels a smooth surface. Depending on the type of resin and the compression, the result was a half-hard, hard, or extra-hard panel. The four types of panels were characterized by minimum and maximum values for their density, tensile strength, bending strength, and thermal conductivity as well as common thicknesses. Giving these characteristics, each type of panel was most suited to a specific field of application. For instance, the porous panels were ideally used as insulating panels in roofs, ceilings, and walls, mostly behind a layer of plaster or wall paper. The half-hard panels were appropriate when stiffness was to be combined with insulation, for instance, in partition walls or subflooring. The harder panels were particularly used for their mechanical properties, moisture resistance, and decorative aspects, e.g. in wall linings, roof coverings, doors, joinery, furniture, and (in the case of extra-hard panels) exterior applications. Only a few companies focused on one particular type of panel, while most made a range, for many applications. An example of the former is the Swedish company Ankarsviks: their Ankarboard was especially lightweight (230 kg/m³) and insulating (0.041 W/mK), and had a low tensile strength (2.45 N/mm²) – a textbook example of a porous panel. Of the companies that manufactured several types of panels, an example is another Swedish company, Härnösands Wallboardfabrik, which produced three types of Hernit panels – porous, half-hard, and hard. The Swedish company Scharins Soner produced Unitex panels, which came in different forms including porous, half-hard, or hard, as well as panels for specific uses, for instance, to be plastered or for acoustic ceilings. The insulating panels Karlit, developed and produced in Sweden by Karlholms Wallboard, were sold in the Belgian market by Van Hoorebeke & Fils. 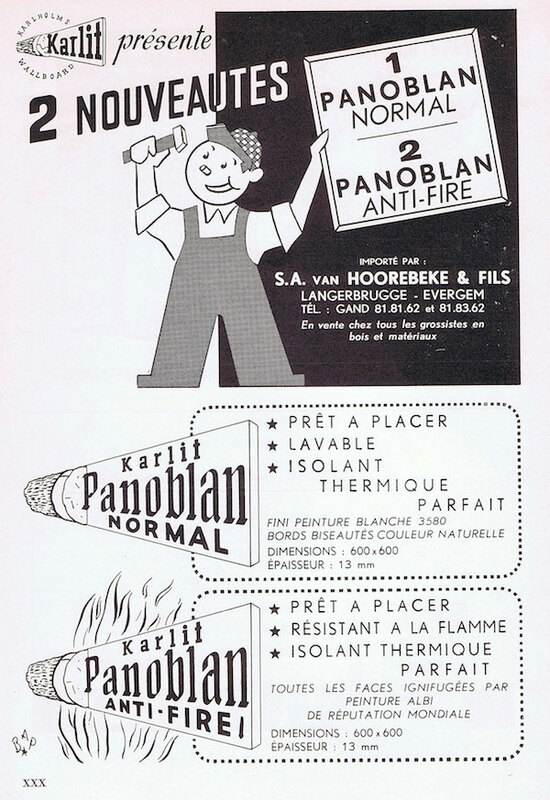 Karlit panels were produced in porous and hard versions, as well as in special versions such as the Panoblan Anti-Fire panel. Strilat panels, distributed in Belgium by Platimex, had a carved or ribbed surface and came in hard and extra-hard (oil-tempered) versions. Also the British Bartrev panel, sold by Continental Wood Products, was offered in different densities. 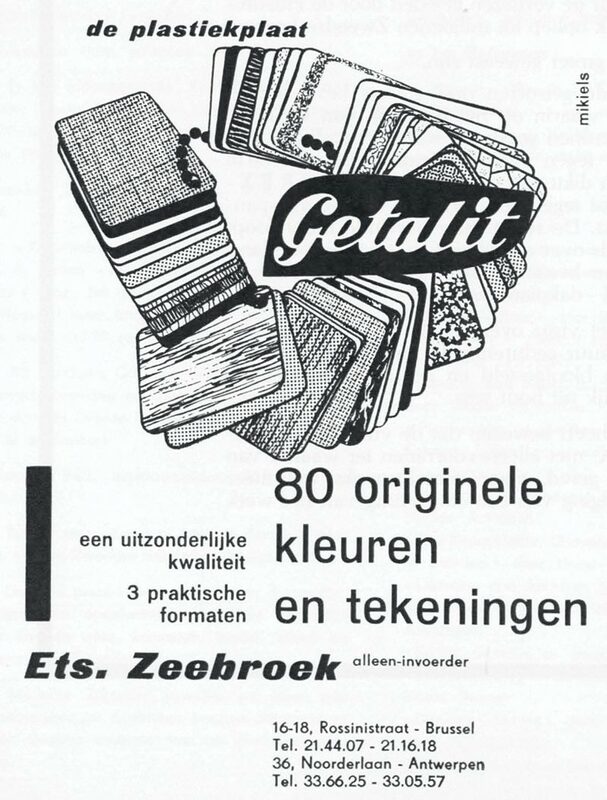 In addition to the many international (especially Swedish) producers, the Belgian firm Unalit was a well-known manufacturer of wood fibre boards. Unalit’s factory was erected in 1939 in Geraardsbergen to reuse the wood scraps created by its parent company, the match producer Union Allumettière. 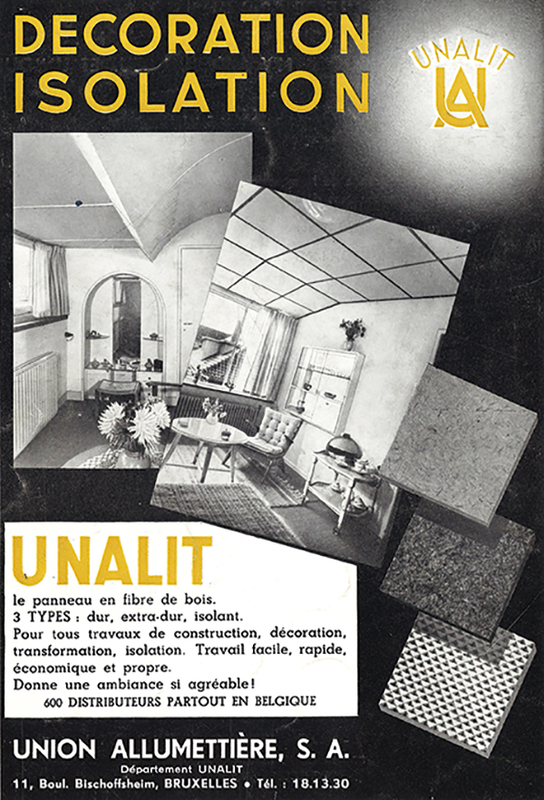 Unalit made several types of wood (fibre) panels, such as Unalit Poreux, Unalit Isolant (the half-hard version), Unalit Dur, and Unalit ExtraDur, which were sold by 600 distributors in post-war Belgium. A particular type of Unalit Dur was Unalit 3215, with a cover made of the special ivory coloured product ‘3215’; it was washable, watertight, fire resistant, and insoluble. In addition, Unalit also produced Unalit Emaillé and Panoplank panels (a hardboard on which a layer of melamine-alky polymer was applied), as well as prefabricated structural frames to which the Unalit panels could be attached. Not every type of wood (fibre) panel fit within one of these four categories, for instance multilayered panels, panels made of very particular kinds of wood, wood fibre cement panels, and plywood. Plywood consists of a number of wood veneer sheets: by alternating the direction of the veneer layers, the strength and dimensional stability of the panel increased. Aquapan, the plywood panel manufactured by Bruynzeel, was developed for façade cladding. It was offered in mahogany wood (to be varnished) and okoumé (to be painted). The panels could be screwed onto a wooden lathing or secured within frames with a mastic around the sides. Multilayered panels were developed to improve or combine specific characteristics, for instance a low-density insulating core with a high-density smooth surface. The Novopan panel was such a multilayered panel; it had a wood fibre core onto which a thin layer of long fibres was pressed to create a wood mosaic. It was developed in Switzerland by engineer Fred Fahrni. 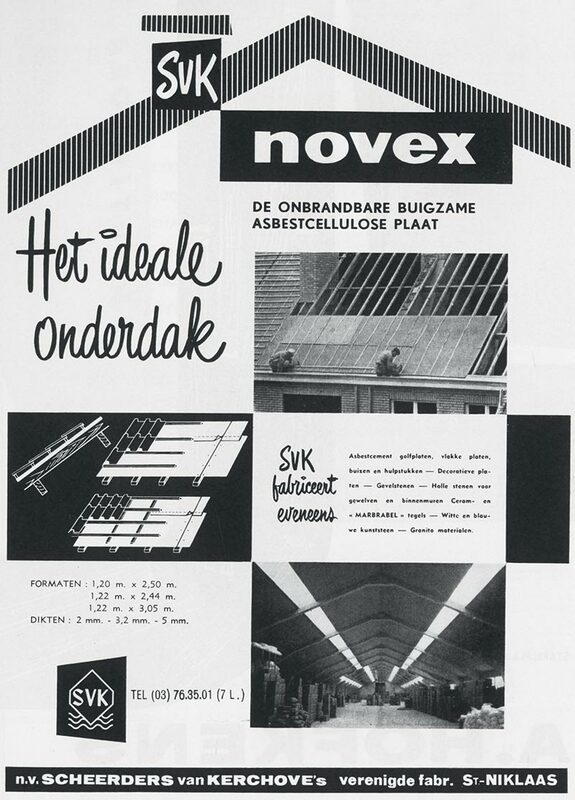 Industrial production began in 1947, and by 1955, Novopan was being produced in 13 countries. In Belgium, Novopan was distributed by Beltrima. It was used for interior decoration, joinery, doors, insulation, subfloors, furniture, etc. Novopan panels were between 8 and 32 mm thick. The volumetric weight varied between 545 and 595 kg/m³, the bending resistance was between 10.79 and 21.57 N/mm², while λ decreased from 0.090 to 0.073 W/mK. Novopan could be manufactured with an extra layer of actual veneer, and these panels were called Panotrix. Hardly any manufacturer specified the wood species used in their panels, except for that of the outside veneer. Often the wood came from Scandinavian pine forests, but sometimes also pulp from non-commercial species and plants were used, such as eucalyptus, bamboo, and sugar. Omniplex was the official Belgian distributor of Duraplac panels; these extra-hard and solid boards, created for ceilings and wainscoting, were made from pressed and oil tempered eucalyptus fibres. They were finished to imitate various wood species, with colours and patterns created by means of rotogravure and a layer of alkyd resin. Duraplac panels weighed 1000 kg/m³; their bending strength was 65.70 N/mm². 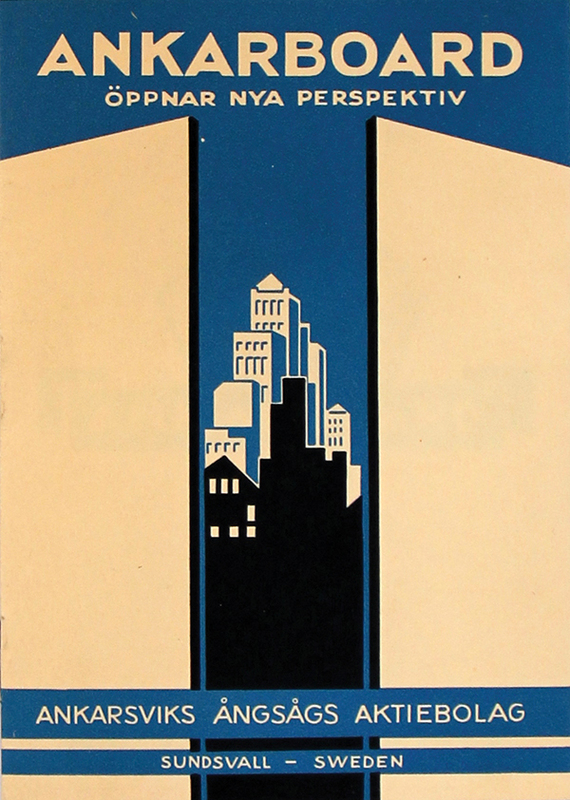 The American Celotex panels were developed during the interwar period and sold in Belgium by Comertec. Celotex was based on sugar cane waste or bamboo fibres without any artificial binding agent. These porous panels were rot-proof and fire resistant, and had a good thermal insulation capacity (λ-value of 0.048 W/mK). A particular category of boards were those that used cement to bond the wood fibres. Wood fibre cement panels came in many different varieties, yet all manufacturers claimed more or less the same characteristics for their products: rot-proof, form retaining, fire resistant, watertight, insulating, affordable, durable, and easy to process. Wood fibre cement panels were rarely used for decorative applications, but rather to create permanent formwork for concrete, subfloors, backboards for plasterwork, etc. Some of the brands available in the post-war period were Heraklith, Dhenatherm, Fibralith, Hermes, and Ardennite. Most of them were characterized by a similar density (350 to 530 kg/m³) and thermal conductivity (0.063 to 0.093 W/mK) and came in various thicknesses between 1.5 and 10 cm. Heraklith, developed in the 1920s in Germany, is probably the most famous brand, as it became a common noun for wood fibre cement panels in general. ‘Genuine’ Heraklith can be recognized by the brand name imprinted in white letters on grey panels. In addition to the standard Heraklith panels, acoustic Herakustik panels and smooth Heraklith PV panels (with a slightly porous magnesium-based coating on one or two surfaces) were available. The Belgian company Dhenaclite produced regular wood fibre cement panels and two upgraded versions: a sandwich panel Dhenatherm and Dhenaprofil. The latter was a wood fibre cement panel enclosed in a galvanized metal plate (mostly applied in industrial buildings). The Dhenatherm sandwich panels were 2.5, 5, or 7.5 cm thick, with a core of respectively 1, 2, or 3 cm of expanded polystyrene insulation. The λ-value of a 5 cm panel was 0.046 W/mK. The German wood fibre cement panels Hermes came in various versions: single panels, panels with a layer expanded polystyrene, and sandwich panels with expanded polystyrene between two Hermes panels. The Hermes panels were denominated with abbreviations like H15, HS25, or HSH50, in which the H stood for Hermes and the S for expanded polystyrene, while the number indicated the total thickness of the panel. The weight varied between 5 and 30 kg/m², and thermal conductivity was between 0.041 and 0.065 W/mK. Similar to wood fibre cement panels were panels made of wood fibres bound with a gypsum mortar, like the Cellulit panels manufactured by Cantillana. Mainly used as a background for plastering work, Cellulit panels were available in thicknesses between 1.5 and 10 cm and weighed 450 to 500 kg/m³. They were rot-proof and fire resistant, and had a λ-value of 0.074 W/mK. Asbestos also was used widely in the post-war period. Asbestos is a silicate mineral, excavated from asbestos mines, and consists of long, thin fibres that are composed of microscopic fibrils. Bound with cement, it was a versatile, strong, durable, noncombustible, rot resistant, and waterproof building material. The asbestos fibres acted as reinforcement for the cement, increasing its tensile strength to approximately 15 N/mm² and bending strength to 40 N/mm². To produce asbestos cement, asbestos fibres were mechanically converted into pulp and mixed with cement (85 to 90% cement and 10 to 15 % asbestos fibres). The asbestos cement paste was then moulded, compressed by hydraulic presses, and cut to the right dimensions before being stored until the cement had completely set. Despite health warnings about asbestos, beginning in the early 20th century, the use of asbestos cement increased continuously until the late 1970s. But finally the general understanding of the health risks related to asbestos fibres (i.e. the microscopic fibrils, which damage lung tissue when inhaled and can cause cancer) led to a dramatic decline in asbestos production, followed by a ban of its use in many countries in the late 20th century. Manufacturers of asbestos cement products in Belgium were Eternit, Scheerders van Kerckhove, Johns Manville, Alfit, Modernit, and Coverit. Eternit produced asbestos cement products from 1905 onwards in Haren (near Brussels), under a license from the Austrian Ludwig Hatscheck, who patented asbestos cement in 1901. The production of roof slates and flat panels in asbestos cement soon expanded, and a second plant was erected in 1923 in Kapelle-op-den-Bos. Asbestos cement products were created for a range of applications, including roofs, wall linings, balconies, industrial applications, and even furniture and interior decoration. In addition to the many variations of the ‘regular’ Eternit panels that were developed in the interwar period, the range of Eternit products was expanded in the post-war period and included the enamelled Glasal panels (produced by Eternit Emaillé). The company also diversified its activities and, beginning in 1957, produced plasterboard through a subsidiary company Gyproc-Benelux. Eternit also co-founded Fademac, which focused on the production of flexible plastics for walls and floors based on asbestos and PVC, and Plastic-Benelux, a manufacturer of raw materials for plastics and synthetic materials. Eternit’s first ‘hit product’ was the standard, flat panel called Eternit. Serving as a substitute for wooden planks and boards, the panels could be processed easily (sawed, drilled, and broken along a pre-cut groove) and were fireproof, rot-proof, impermeable, and hardwearing. Panels were made in thicknesses from 3.2 to 20 mm; they weighed an average of 10 kg/m² (for 6 mm panels). The λ-value was equal to 0.25 W/mK. Panels were offered in double compressed, single compressed, or not compressed versions. Double compressed panels had a very smooth surface and were more flexible as well as stronger, with a failure load 40% higher than single compressed panels. The panels were used for construction works (concrete formwork) as well as interior applications such as doors, furniture, wall linings, paneling, window sills, and ceilings. Panels were screwed on a wooden frame, lath, or blocks, or glued to a lattice or a flat surface. Joints were finished ‘cold’, overlapping, or covered with strips in Eternit, wood, plastic, or aluminium. Most variations to this standard panel were processed and attached in the same ways. Eternit’s flat panels called Eflex were coloured in the mass (grey, red, green, and yellow) and highly resistant to wear because of the double compression process. Eflex panels were made in three thicknesses (2, 3.2, and 5 mm) with corresponding weights (4.35, 6, or 10 kg/m²). As the brand name suggests, Eflex panels were very flexible. They were used for wall linings, ceilings, floors, doors, countertops, and furniture. Eternit made other special purpose panels in asbestos cement during the post-war period. Its decorative panels with textured surfaces included a ribbed Eternit panel (5 mm thick, weighing 9 kg/m²), Acimex panels (with grains of sand embedded in the surface), Granite panels (with coloured mineral grains embedded in the surface, 5 mm thick and weighing 10 kg/m²), Elo panels (for wainscoting, mimicking wood), Exterelo panels (for exterior uses), and Elostone panels (for walls and fireplaces, mimicking natural stone). Eternit developed a complete range of products for roof constructions, e.g. the Romana and Gallia roof panels (large yet very thin and lightweight flat panels), the Ardex corrugated panels, and Doublex roof boarding. The Ardex corrugated panels, on the market since 1952, came in a grey, pink, ‘havana’, and green, and were coated with a transparent, synthetic resin. Within the range of corrugated panels by Eternit, the Ardex panels had the smallest corrugations, only 20 mm high (compared to 31 and 51 mm for the other types). They were also used in facades and balconies. When used in roofs, the panels were often combined with Doublex roof boarding, which were flat boards with special flanges on the side to overlap. The Doublex boards had a smooth, light grey surface. The λ-value of Doublex boards was 0.25 W/mK. A popular Eternit product was Menuiserite, a panel made of asbestos cement and cellulose fibres, which gave the pink or yellow panels a soft touch. Menuiserite was fireproof, rot-proof, form retaining, watertight, and insulating (λ between 0.19 and 0.21 W/mK). A special feature of Menuiserite was its flexibility, making it ideal for roof sheathing (panels of 2 mm); it was also used for ceilings and wall linings (panels of 3.2 or 5 mm thick). The panels were produced in various sizes, weighing 3.9, 6.2, or 9.8 kg/m². The tensile strength was 9.8 N/mm² and bending strength was 34 N/mm². Menuiserite is still being produced by Eternit today but without asbestos (the letters NT, short for New Technology, are applied to those building materials in which no asbestos is used). 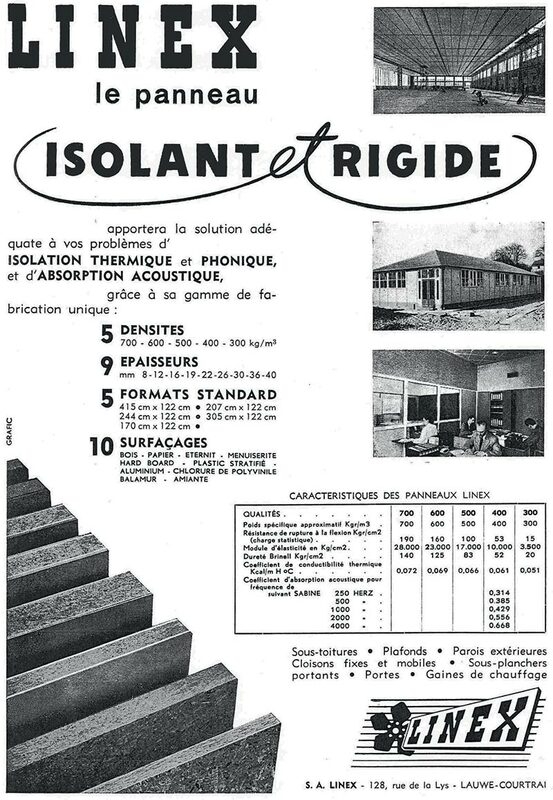 Eternit’s asbestos cement products for flooring (or other applications in which a high wear resistance was important) were Massal, the hollow elements ACE, and ‘333’. Massal was a durable, solid panel and practically indestructible. It was coloured in the mass (in white, grey, red, yellow, and green), strongly compressed in a hydraulic press, and autoclaved. With a thickness between 10 and 40 mm, Massal weighed 20 to 80 kg/m². In addition to floors, Massal was used for thresholds, skirting boards, window sills, fire-places, stairs, and façade cladding. It was fixed to the loadbearing wall or floor structure like a stone veneer, with hooks or anchor rods in iron or copper, which were embedded in the loadbearing structure and fixed to the Massal plates with cement. Similar to Massal, but only available in black with a slightly textured surface, was ‘333’, used for floors and fire-places. The hollow elements ACE, coloured beige and lightly textured, were mainly used for stairs and fire-places. ACE stands for Amiant Ciment Extrudé, referring to the extrusion process with which these hollow elements were fabricated. 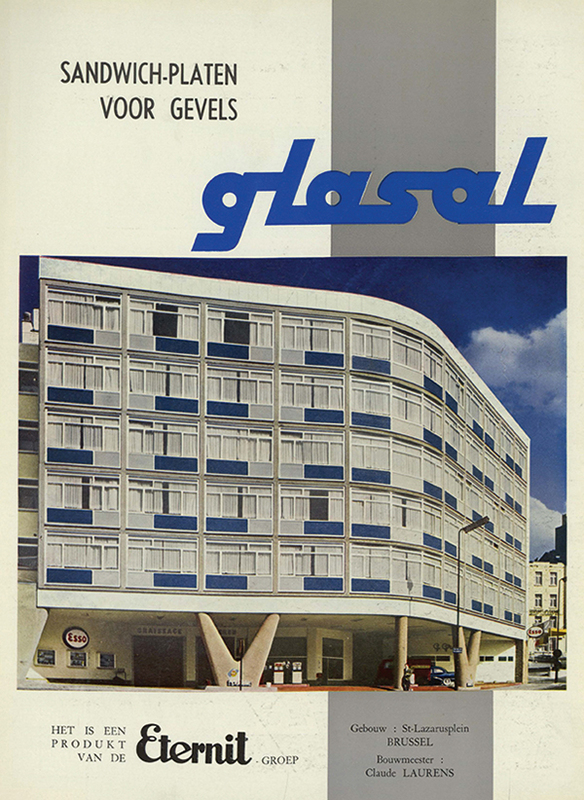 The Eternit product that is probably most closely linked to the colourful image of post-war architecture in Brussels is Glasal. Put on the market in approximately 1957, Glasal is a double compressed, autoclaved panel intended for inside as well as outside applications. The panels had a top layer of colourfast enamel, applied with a spray gun, and vitrified in an oven. Glasal also was watertight, damp-proof, insulating (λ = 0.3 W/mK), smooth, easy to clean, rot-proof, and resistant to scratches, shocks, acids, grease, solvents, frost, and heat. Despite being very stiff (with a bending resistance of 49 N/mm²), Glasal panels were easily worked with ordinary tools like saws and drills. At 3.2 mm thick the panels weighed 7 kg/m²; other thicknesses, from 5 to 12 mm (weighing 10 to 24 kg/m²), were available on demand. Glasal panels existed in 30 colours, including solid colours as well as speckled, marbled, and linen patterns. Eternit offered a 10 year guarantee on the resistance and durability of Glasal. At the end of the 1960s, the panels were being exported to 50 countries. Eternit also produced perforated Glasal panels, Glasal S panels (with a slightly rough finish of the enamel, available in 10 colours), and Glasal sandwich panels. The sandwich panels were composed of an outside layer of Glasal, a core of insulation (polystyrene, cork, flax fibre, expanded polyurethane foam, or mineral wool, with sometimes an extra damp-proofing), and an inside surface of Glasal, Eflex, Pical, or another Eternit panel. For example, a 27 mm sandwich panel made of two Glasal panels and a polystyrene core had a K-value of 1.23 W/m²K and weighed 14 kg/m²; if the polystyrene core was 40 mm instead of 20 mm, the K-value decreased to 0.71 W/m²K and the weight was 16 kg/m². Glasal sandwich panels were especially used in curtain walls and façade frames, taking the necessary precautions for expansion and water tightness (with putty, mastic seals, Thiokol, silicone, synthetic foam, a glazing bead, etc.). The panels could also be screwed onto a wooden structure (overlapping or with strips to cover the joints). Inside, the panels could also be glued to lath or a smooth surface (with polyvinyl acetate, epoxide glue, contact adhesive, or resorcinol). Scheerders Van Kerchove (SVK) was another important manufacturer of asbestos cement cladding and sandwich panels. 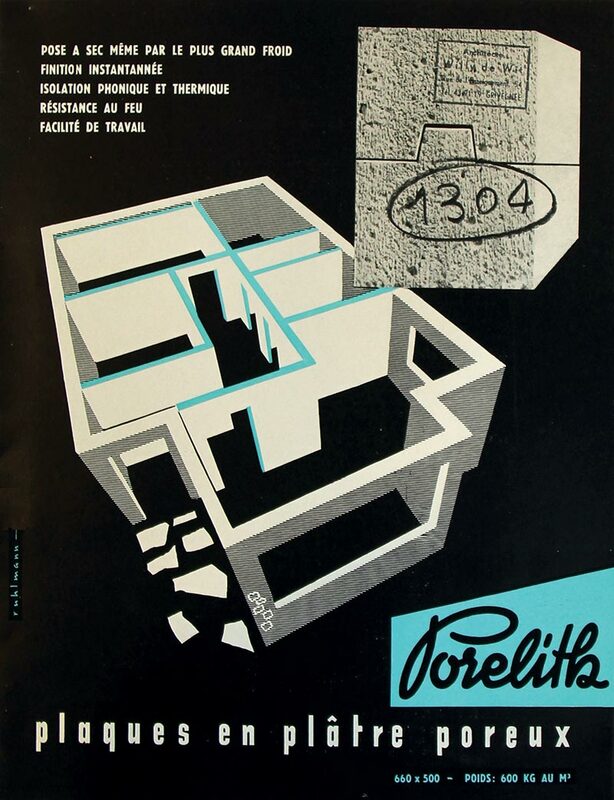 Like Eternit, they produced a wide range of products, including the regular panels SVK; decorative panels; corrugated plates; flat panels; sandwich panels called Multiboard; flexible panels in asbestos-cellulose Novex; elements in ‘granito’; Ceram and Marbrabel floor tiles; and artificial slate. Three different types of decorative panels were developed: Ornit, Lambriso and Ornimat. Ornit panels, offered in several lively colours, were mainly used in living areas. Lambriso panels imitated oak and were mainly used for wainscoting. Ornimat, the most popular of SVK’s decorative panels, was a flat, compressed panel with a solid, smooth, and shiny top layer of polyester, which was cured by means of polymerisation. Ornimat was impermeable, fireproof, durable, strong, rot-proof, colourfast, and resistant to low and high temperatures. The panels came in 20 tints, were 3.2, 5, or 10 mm thick, and weighed between 6 and 20 kg/m². Ornimat was used as such or in sandwich panels. SVK’s Multiboard sandwich panels came in two forms: a flat panel (for interior and exterior walls) and a corrugated panel (for roofs). Both were composed of two asbestos cement panels with granules of mineral insulation (possibly mica) in between. The corrugated panels were 122 by 98 cm, 4.5 cm thick and weighed 40 kg per panel. The flat panels were 250 by 120 cm, 3 or 4 cm thick and weighed 85 or 102 kg per panel. According to tests by the independent research laboratory OREX, the corrugated panels could carry a uniformly distributed load up to 1,020 kg/cm. As for the thermal conductivity, empirically defined, the λ-value was approximately 0.13 W/mK for both corrugated panels and the 4 cm thick flat panels. Other asbestos cement companies produced similar but fewer kinds of products. For instance, Alfit produced single compressed flat panels (between 4 and 10 mm thick), double compressed panels (with two smooth surfaces), corrugated panels, Alfit Incruste (with a decorative pattern imprinted on it), Alfit Granite (with a decorative top layer resembling natural stone), Alfit Marbre (resembling natural marble), Alfo panels (for wainscoting), and Alfit Emaillé (in several plain colours). A company that did not produce panels itself but incorporated them in a sandwich panel was Atemo. The Atemo Privas panel was composed of a core in expanded polystyrene, with asbestos cement panels on each side and an optional finishing layer or coating. These were used mainly as façade cladding or in curtain walls. The panels were between 2.5 and 5 cm thick and weighed 20 to 25 kg/m². The thermal conductivity K was between approximately 0.58 W/m²K (for 5 cm panels) and 1.28 W/m²K (for 2.5 cm panels). The panels were frost-proof, watertight, resistant to chemical agents, and had good mechanical properties. 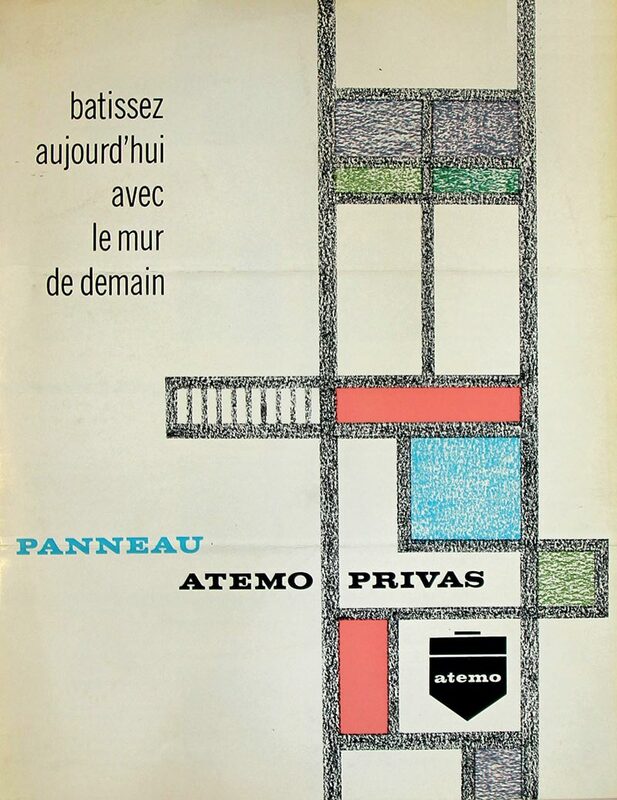 In addition to the ‘Brut’ version (with grey and cheap asbestos cement panels, without any decorative treatment), Atemo offered a wide range of surface treatments and colours by using, for instance, Glasal, aluminium, PVC, Skinplate, and Temcoat panels. Skinplate, produced by Phenix Works, was a thin metal or aluminium sheet onto which a thin coating of PVC was applied. Temcoat was a coating based on thermosetting resins, died in the mass, intended to minimize dirt adhesion. It was used in the Cité Modèle in Brussels, where thousands of square meters of sandwich panels with Temcoat finish were installed in Chamebel window frames. Plasterboard was a common material for finishing the interiors of both masonry and wood-frame buildings. Invented in the 19th century, plasterboard was a prefabricated panel made of compressed gypsum with sheets of paper covering both sides. From the middle of the 20th century onwards, plasterboard became one of the most extensively used building products as it replaced wet plastering (hence another name for plasterboard is ‘drywall’). 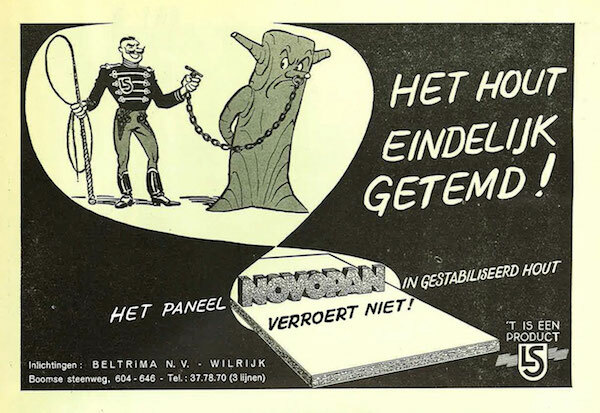 Eternit began to make plasterboards in the mid-1950s, reportedly the first manufacturer in the Benelux to do so. In 1957, Eternit set up a subsidiary Gyproc-Benelux. Gyproc, an internationally known brand of plasterboard, manufactured since the interwar period, soon became (and still is) synonymous with plasterboard in Belgium. Gyproc-Benelux developed simple plasterboards (e.g. Gyproc, Gyplat, and Platroc) as well as systems for non-loadbearing partition walls made with plasterboard (e.g. Gypunit, Latunit, and Gyplank, which combined layers of plasterboards with a honeycomb cardboard core). Eternit’s regular Gyproc board had ivory paper on the front side, ready for painting or covering with wall paper, while the paper on the other side was grey. Boards came sized 120 or 122 cm wide and between 183 and 365 cm long. The boards were 9.5 or 12.7 mm thick and weighed approximately 8.5 or 10.4 kg/m². In addition to its insulating capacities (the λ-value varied between 0.16 and 0.21 W/mK), a Gyproc board was also resistant to fire. Gyproc was easily sawn or cut and drilled. It was installed by attaching it to a wooden framework with stainless steel screws or nails placed every 10 or 20 cm. The wooden posts of the framework needed to be 2 cm thick and 5 cm wide, spaced at 40 cm in the longitudinal direction and 45 cm (for thin Gyproc boards) or 60 cm (for thick Gyproc boards) in the perpendicular direction. Another option was to glue them to the wall with a special plaster mixture. From the end of the 1960s onwards, Gyproc-Benelux also produced the Metal-Stud frame, onto which the Gyproc panels could be screwed. In either case, whether the boards were fixed to a frame or glued to the wall, the joints had to be covered with two layers of joint filler with a joint tape in between. The Gyproc boards were tapered along the long edges, to allow the filled joint to be flush with the front face of the board. Eternit developed many variations of the regular Gyproc board. All these variations could be used to cover walls and ceilings, and were also easy to process and to attach, by means of screws or nails on wooden lath, or with glue. The first variation was the Gyproc-aluminium board, made with a sheet of aluminium foil covering the grey side of the board. The aluminium foil increased the fire resistance of the boards, and when applied behind radiators, better reflected heat into a room. Taking into account the layer of air alongside the aluminium foil, the K-value was 2.37 W/m²K. Another version was the Gyplat board, with a sheet of grey paper on both sides. These panels needed to be skimmed with a thin (4 mm) layer of the special plaster Stucovit over the entire surface. The edges were slightly rounded and did not need to be treated with joint filler. The panels were only available in 9.5 mm thickness, weighing 7.8 kg/m². They were 40 cm wide and between 100 and 200 cm long. A special edition plasterboard was Gyplat Luxe, which was treated with a decorative, polyester cover and available in six solid colours and four wood patterns. Since no plaster was required to cover the surface or fill joints, the Gyplat Luxe board had plain edges. The boards were 10 cm thick and weighed 8 kg/m². Finally, the Platroc board was almost the same as the regular Gyproc board, yet it had plain edges. Platroc came in a 6.5 and 9.5 mm version. Confusingly, the brand name Platroc was also the name used by Gyproc-Benelux for their Gyproc boards when sold outside of the Benelux. 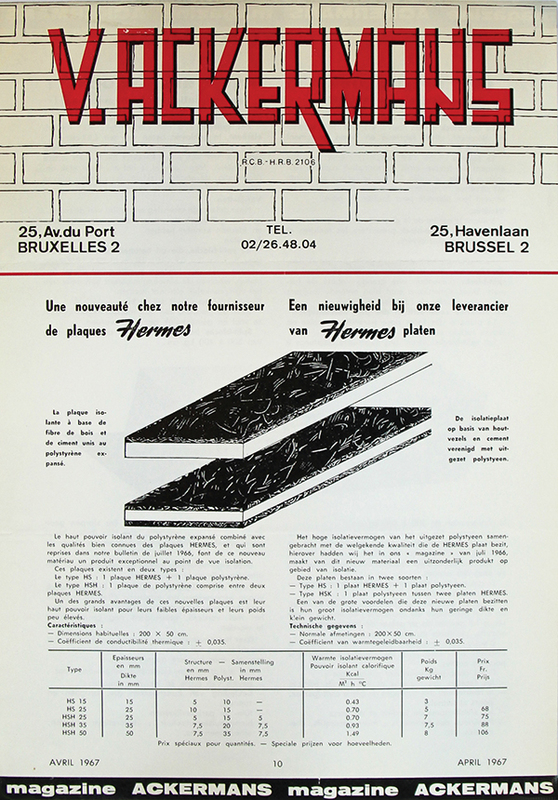 Eternit and Gyproc-Benelux became the Belgian market leader in plasterboards and similar products in the post-war period. 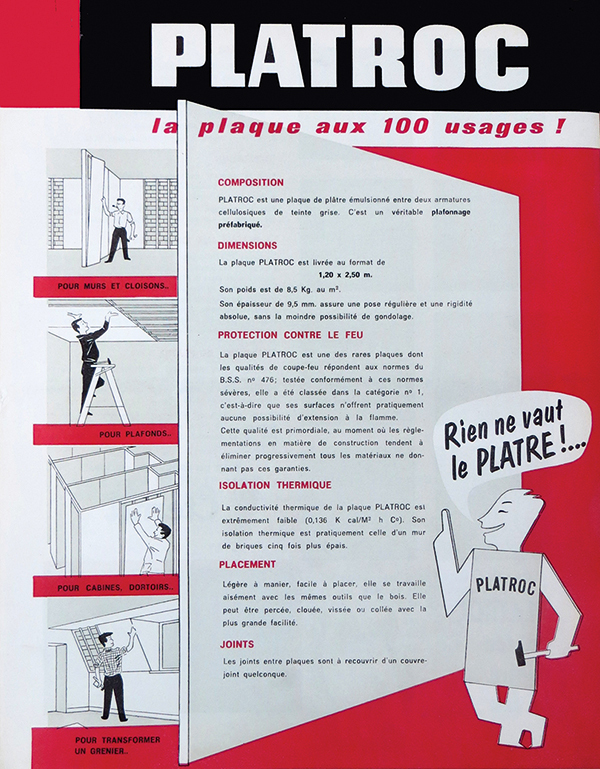 Among the few other companies producing prefabricated plasterboards was Porelith Belge, which made porous plasterboard tiles called Porelith, and Fabribeton, manufacturer of the patented system Pro-monta. The latter consisted of thick plasterboard tiles that were to be stacked like masonry and connected with liquid plaster in the hollowed edges. In addition to wood fibres, other vegetal fibres that became ingredients in panels were flax and straw. Flax was a raw material for Linex, Sonalex, and Interlin panels (‘lin’ is French for flax), while Stramit panels were made with straw. The three flax panels are strikingly similar, except that Linex used flax straw, while Sonalex and Interlin contained flax fibres. All three panel manufacturers used a synthetic resin to agglomerate the flax straw or fibres (Linex specified thermosetting resins). The mixture was compressed to create homogeneous, flat panels. These panels came in various thicknesses (between 8 and 50 mm) and densities (between 300 and 700 kg/m³), which determined their particular mechanical and thermal characteristics. For instance, depending on the density, the λ-value of Linex panels varied between 0.059 and 0.084 W/mK; bending strength was between 1.47 and 18.63 N/mm²; and tensile strength varied between 2.94 and 8.83 N/mm². Interlin panels had very similar properties: the λ-value was between 0.063 and 0.085 W/mK and bending resistance varied from 2.06 to 18.39 N/mm². These flax panels were usually 122 cm wide and between 170 and 415 cm high. Another standard size was 203 by 81 cm (mainly used for doors). The variety of flax panels available resulted in a very broad field of applications. Like the wood fibre panels, flax panels came in different densities for specific applications. For joinery, decoration, and furniture, the manufacturers recommended densities of between 500 and 700 kg/m³, while panels of 400 kg/m³ were ideally used for heat and sound insulation, and 300 kg/m³ panels were mainly meant for sandwich panels. Also like wood fibre panels, flax panels were rot-proof and easily sawn, drilled, nailed, screwed, glued, varnished, plastered, etc. All three brands offered various surface treatments: smooth and shiny with a golden yellow tint (due to the production process) or sanded in order to be painted, or covered with wall paper or a decorative finish (wood veneer, triplex, hardboard, asbestos cement, Menuiserite, sisal paper, asbestos paper, kraft paper, plastic, aluminium foil, rubber, etc.). Stramit panels consisted of straw without any additional products, compressed into panels of 5 cm thick, onto which kraft paper was attached with synthetic glue. Stramit was easy to process, installed quickly, stiff, lightweight (19 kg/m² or 380 kg/m³), and fire resistant. The panels were 122 cm wide and between 244 and 305 cm high. They were used for construction works in which not only the strength by also the thermal insulation was an important aspect (λ = 0.093 W/mK), e.g. as roofing boards, in floors, as insulation, and wall linings. Manufactured in various countries according to the Swedish patent, Stramit was distributed in Belgium by Anc. Ets. Paul Van de Kerchove. Similar to post-war insulation products, cladding and sandwich panels began to incorporate the new, synthetic materials when they came on the market (in addition to vegetal and mineral materials). Three examples of such plastic and synthetic materials are polyester, poly(methyl methacrylate) (PMMA), and polyvinyl chloride (PVC). Plastic-Benelux, a subsidiary of Eternit, manufactured one of the widely used polyester panels, namely Clartex. The panels were made by impregnating a mat of glass fibres with a polyester-based resin. Clartex was produced in flat panels, corrugated panels, and rolls with a corrugated profile. Clartex panels were said to be durable; waterproof; resistant to household chemicals and solvents; unbreakable; and thermally insulating (λ = 0.21 W/mK). 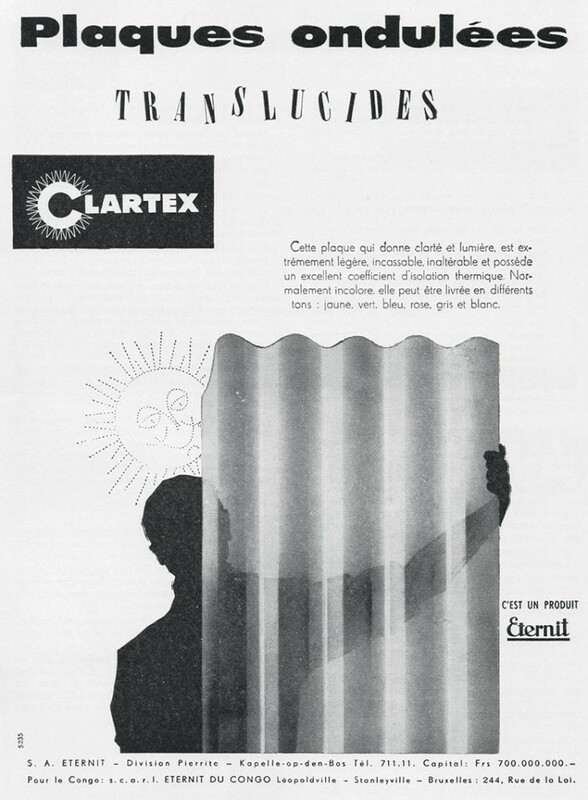 Clartex was translucent and available in various tints (yellow, green, blue, red, grey, white, and pastels), relief patterns, and transparent and ‘super-transparent’ versions, the latter called ‘crystal’. The light transmittance of regular transparent panels was between 85 and 90%. Clartex, commonly 1 or 1.5 mm thick, was used for windows; skylights (often in combination with the asbestos cement Ardex corrugated panels); parapets; façade elements; transparent ceilings and partition walls; doors; furniture; etc. The flat panels could be applied with polyester glue and adhesives based on epoxy resin, or inserted within an window or door frame. The corrugated panels and rolls were screwed onto a wooden lathwork. Another popular material used to make transparent or translucent panels in the post-war period was poly(methyl methacrylate) (PMMA), better known by brand names such as Plexiglas and Perspex. PMMA was developed at the beginning of the 1930s almost simultaneously in the U.K. and Germany, and became commercially available just before the Second World War. Plexiglas was developed by the German firm Rohm & Haas Gmbh Darmstadt and distributed in Belgium by the Brussels company Camille Honhon. Especially the corrugated panel Plexiglas XT ondulé seems to have been promoted in Belgium. Plexiglas XT ondulé spread a soft, filtered light. It was easy to use; durable; 92% light transmitting; resistant to thermal and mechanical shocks; and colourfast. Its counterpart was the corrugated panel Perspex, developed by the British company Imperial Chemical Industries (ICI). In its marketing literature, ICI strongly emphasized that the panels were produced by casting, which would reduce internal tensions to a minimum. The panels had a 92% light transmission and a good resistance to vibrations and shocks (and therefore often were used as a substitute for glass). They were lightweight (4.4 kg/m²), durable, and easy to put in place and maintain. A third plastic, polyvinyl chloride or PVC, was a component of the Solclip panel, produced by Selcim (a subsidiary of Solvay & Cie). These PVC panels were ribbed (every 10 cm) and included a layer of glass fibres or rock wool on the back. They were mainly used for false ceilings. They were strong and stiff, sound-absorbing (thanks to small perforations), light-diffusing, insulating (λ-value of 0.15 W/mK), noncombustible, lightweight (2 kg/m²), and easy to clean. Moreover, they were made in various colours. They were attached invisibly with clips to a metal frame, so they could be easily put in or taken out. Lamination is a production technique in which multiple layers of materials are joined together to create a composite board, panel, or sheet. The main (base) material used for making covering laminates was a specific type of paper, usually kraft paper, which is a strong, brown paper (‘kraft’ is German for strength). The base layers would be drenched in a synthetic, thermosetting resin or another solution. The top layer was often a printed or coloured sheet or a wood veneer, treated with an extra coating of thermosetting melamine resin. The whole was cured under pressure and heat. The result was a solid, durable, multi-layered panel. One of the most famous laminates known worldwide is Formica, invented in the U.S.A. in 1913. 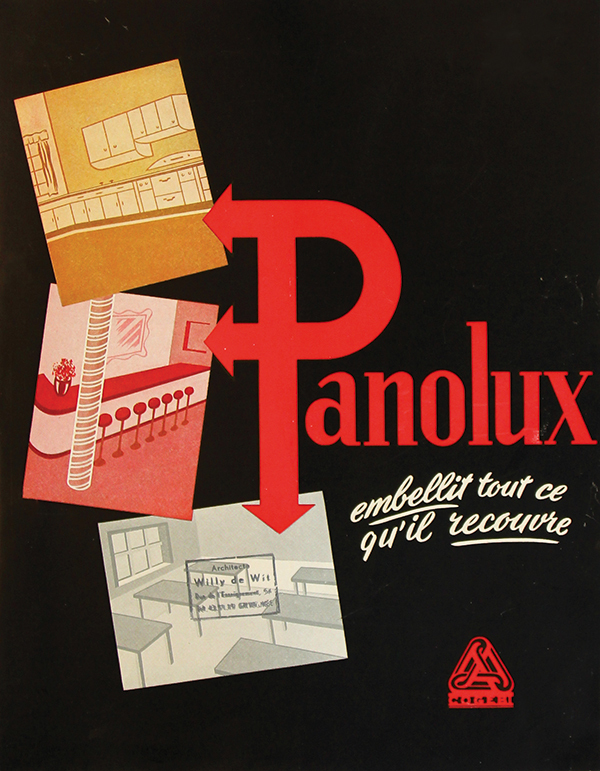 A Belgian counterpart of this iconic brand was Panolux. Formica is a hard, plastic panel made of multiple layers of kraft paper with a coloured paper (or a veneer, print, or foil) on top, which was finished with a layer of pure cellulose (95%). The papers were impregnated with thermosetting synthetic resins, specifically, melamine-formaldehyde resin for the top layers, and phenol-formaldehyde resin for the lower layers of kraft paper. The layers were stacked and compressed by hydraulic presses, at approximately 105 kg/cm² and 150° C, which amalgamated the resins and sheets of paper. Originally developed as an industrial insulating material, Formica was applied worldwide in the post-war period for furniture, doors, wall linings, and decoration. A Belgian branch of The Formica Company was set up in 1962 (before that, Formica was distributed by concessionaires all over the country). Formica was branded as a functional, practical, decorative, hardwearing, and hygienic panel, perfectly smooth and easy in maintain. Formica panels were commonly 1.6 mm thick, finished on one or both sides, and could have post-formed rounded edges as a special feature. The company strongly focused on variety in appearance: in 1964, 150 designs and three different finishes (matte, shiny, and satin gloss) were available. Formica was the most widely sold hard-plastic decorative panel worldwide. Nevertheless, many other companies entered the laminated plastics field, but with products that had slightly different features. 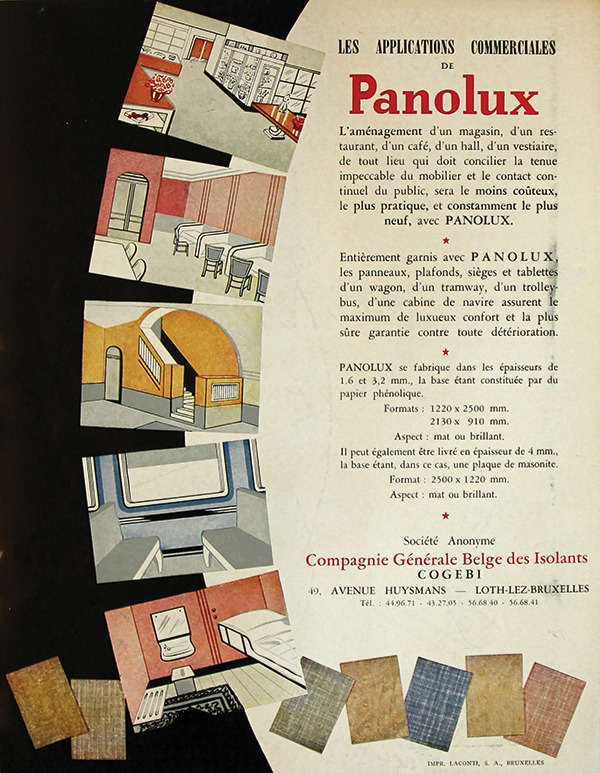 In Belgium, the Compagnie générale belge des isolants (Cogebi) produced a laminate called Panolux. This consisted of five to eight layers of strong paper impregnated with thermosetting synthetic resins, and one to three layers of transparent or pigmented cellulose mixed with pure melamine. The combination was compressed at 100 kg/cm² and 140° C. These panels were smooth, solid, easy to maintain, noncombustible, durable, and hardwearing, and resisted heat, moisture, alcohol, acids, and grease. They were easy to saw, drill, and glue (on a support in wood, multiplex, or fibre panels); the backside of the panels was mechanically or chemically treated to ensure good adhesion. The panels were 1.2, 1.6, or 3.2 mm thick; a 4 mm sandwich panel with a core in Masonite was also available on demand. Cogebi offered a large choice in patterns and colours, with a matte or shiny finish. Not only the properties, but also the field of applications, were similar to those of Formica. 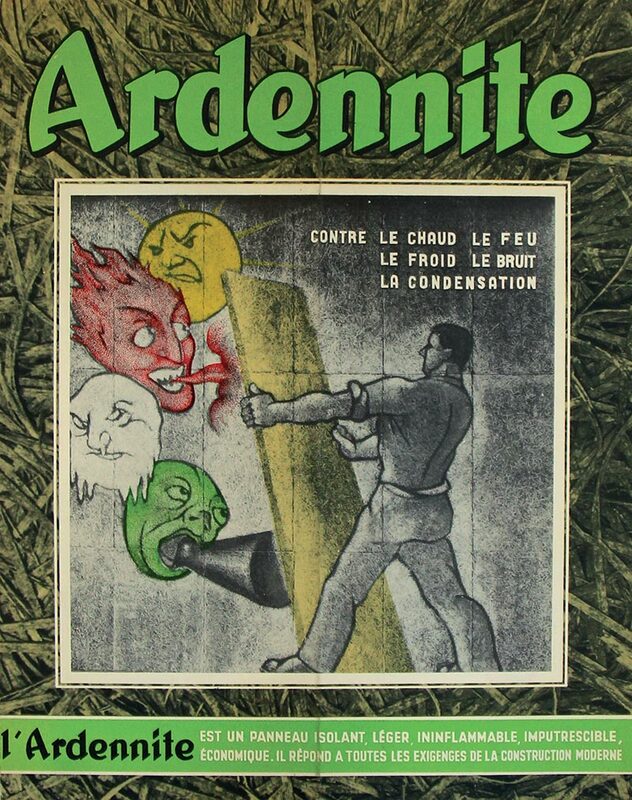 While Cogebi actually used the promotion line ‘la qualité américaine au goût et aux prix européens’, it nevertheless stressed that the panels were produced in Belgium. 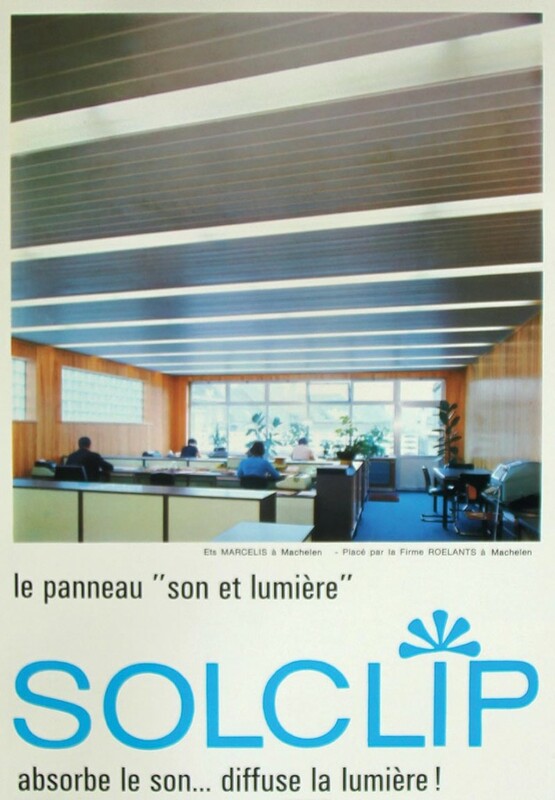 Another product sold in Belgium was the laminate called Kellco, developed in Switzerland by Keller & Co. Kellco panels were available in 45 designs and patterns, with a satin gloss. The standard size was 126 cm by 254 cm, 1.3 mm thick. Not a laminate, but based on the same materials, was Dufaylite. 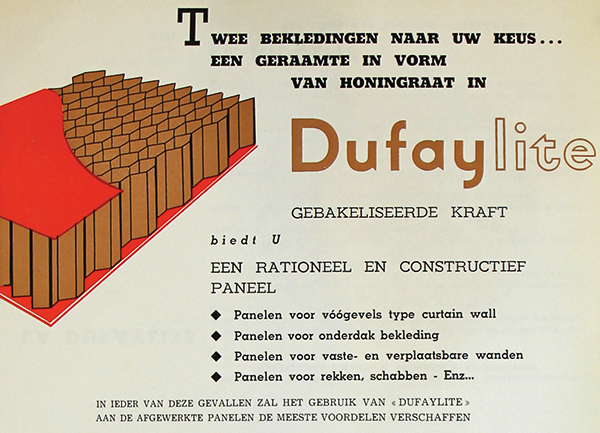 Distributed in Belgium by Nidolite, Dufaylite had a honeycomb structure that was made of kraft paper with phenol-formaldehyde resin, which was polymerised in the oven at 180° C. Produced in various thicknesses and sizes (up to 200 by 520 cm), Dufaylite was a stiff, lightweight, rot-proof, and insulating panel. It was used mainly as the inner core for sandwich panels, in which case it was covered with Gyproc, Glasal, Unalit, Masonite, Skinplate, or another decorative board or plate. In 1961 and in 1966, the Belgian Building Research Institute (BBRI) published two articles in its journal on plastic materials, in which concerns were raised about the proper installation and durability of plastics. One of the conclusions was that it was too soon to assess their durability and that some caution with respect to the qualities claimed for the new materials that flooded the post-war market was appropriate. Indeed, the advantageous characteristics and properties claimed for cladding and sandwich panels by their manufacturers were numerous: aesthetic, watertight, rot-proof, noncombustible, insulating, strong, solid, economical, easy to install, low-maintenance, resistant to chemical agents, etc. However, many of these could not be confirmed as very little objective, non-commercial data about them existed. Only a few company catalogues and brochures included numerical values on products’ bending strength, weight, or thermal conductivity for instance. An a-typical source is the ‘Technical guide for the materials of the companies in the Eternit Group’: in 513 pages, this handbook gave a very detailed and exhaustive overview of all the Eternit products, including their characteristics, their sizes, suggested text for building specifications, and many pictures, showing the products from fabrication to installation. The Eternit handbook also included a list of norms and official documents that applied to their products (e.g. NBN 280, 281, 283, 306, 333, 550, 551, and 552). The catalogues of other companies were, of course, less elaborate. In addition to the lack of objective data, there was also a complete absence of comparative data; this is striking because several products of different companies appear to be rather similar. 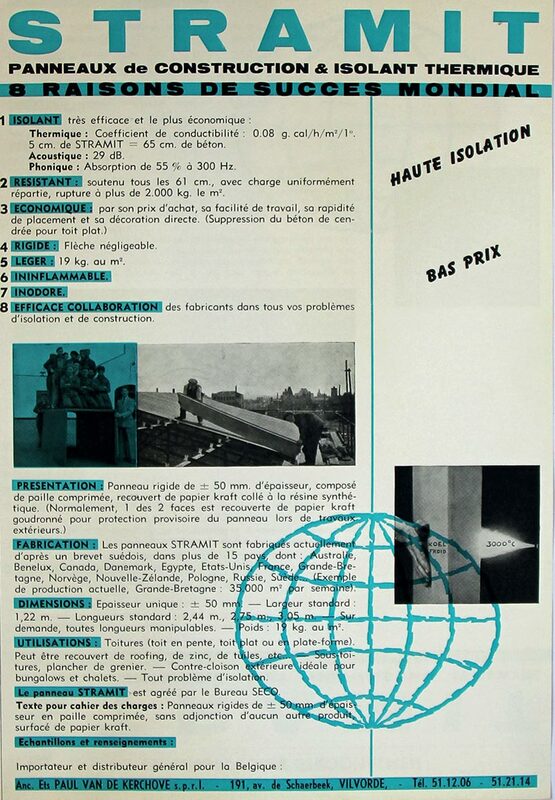 One comparative effort was reported by J. Guiot, administrator of the National Bureau for Documentation on Wood, in a themed issue of Architecture on wood (1958, n° 23-24): Guiot discussed the four main types of wood fibre panels and the properties (density, tensile strength, etc.) by which they could be differentiated from one another. 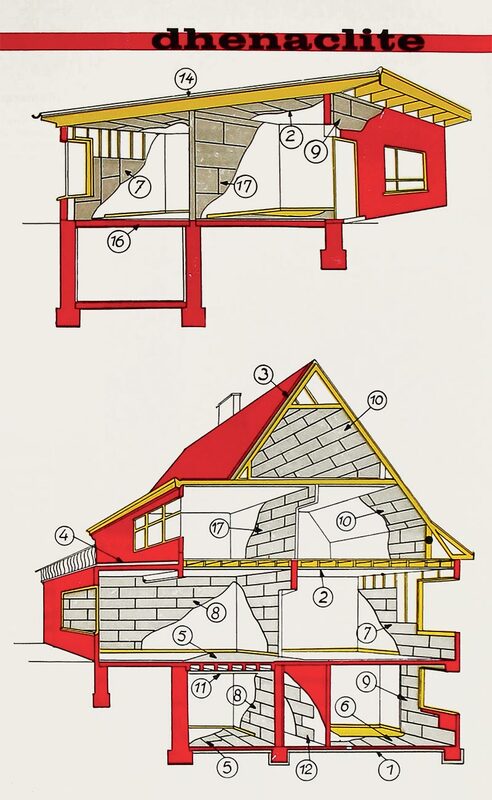 That the need for objective and comparative data was not confined to Belgium is nicely illustrated by a Dutch report on thermal properties of building materials (published in 1964 by the Stichting Ratiobouw). This report included a list of hundreds of contemporary materials documented in the National Building Centre, along with the specific weight, thermal conductivity, and specific heat of each. A notable feature of the list is that some types of materials were treated generically (e.g. bricks or cement), while for other materials (including those used for cladding and sandwich panels) it was necessary to include the various brands and their different properties. Furthermore, it is striking how many of the listed brands for cladding and sandwich panels were known in Belgium and vice versa. 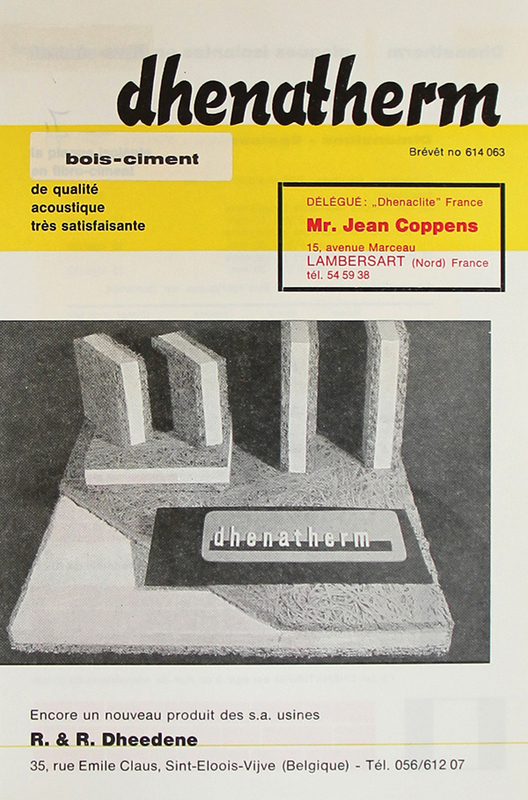 Some 40 applications of cladding and sandwich panels in post-war housing in Brussels were mentioned in the contemporary architectural press. The functions for which such panels were used were various, from wall linings, façade cladding, false ceilings, partition walls, and roof insulation, to balcony parapets. These cases show that the use of cladding and sandwich panels increased between 1958 and 1966. This increase can almost entirely be explained by their use in large window frames or small-scale curtain walls. Moreover, it was one very popular brand that boosted this increase, namely Glasal, which appeared around 1957. Coloured Glasal panels of various sizes, placed in wooden and aluminium window frames, were used in the full range of residential buildings, small and large, social and private. The application of Glasal and other panels shows how quickly that segment of the building market was developing. It also highlights the rise of new architectural concepts and trends such as the extended, storey-high window frames and increased use of colour. Eternit was not the only material producer that followed (or helped set?) these trends, with their range of products. In a company brochure, Scheerders Van Kerchove stated that the SVK Ornimat and sandwich panels were explicitly developed to respond to the increasing importance of colour in contemporary architecture. A few other products were mentioned in the case studies. Linex was used in both roof constructions and partition walls – always for its insulating qualities. Also Celotex was used for ceilings as well as wall linings. The use of Gypunit (e.g. 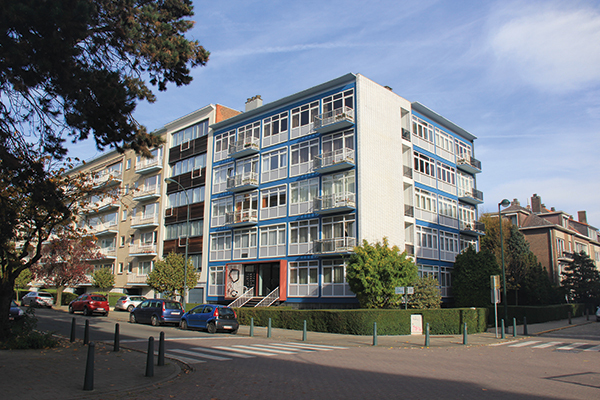 in the high-rise buildings Ieder Zijn Huis in Evere by Willy Van Der Meeren, and Cité Modèle by Renaat Braem and others in Brussels) illustrates the rise of partition walls. 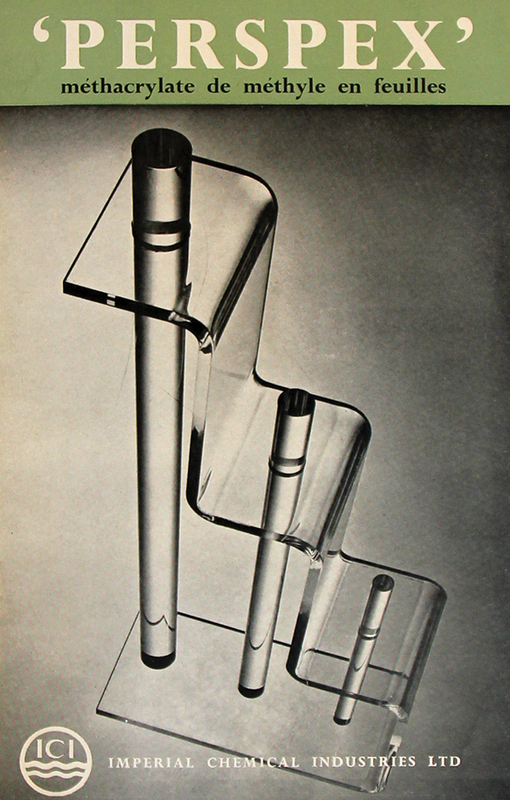 Also Perspex, Cellulit, corrugated plates by Eternit, Massal, Masonite, and Formica were mentioned. In addition, sometimes a type of product was mentioned but not the brand, i.e. wood and wood fibre panels, asbestos cement, sandwich panels, plywood, aluminium, enameled panels, wood fibre cement panels and PVC. Go to the image archive or Read "precast concrete façade panels"